I don’t really like Ina Garten on her Food Network Show show Barefoot Contessa. There. I said it. Oh, she’s perfectly nice and all, but it’s something about the Hamptons lifestyle and her stiffness on camera that I just can’t connect with. However, for as much as I don’t care for Ina Garten on TV, I love her cookbooks. I mentioned a little while ago that my mom gave me her new Back to Basics cookbook. In print, Ina comes across as much more sincere and personable than she does on TV. The food photography does not disappoint, even with my high expectations, and she adds some personal touches, like a list of 10 things not to serve at a dinner party. In this Back to Basics cookbook, Ina focuses on classic recipes with the volume turned up, the same kind of food she likes to entertain with. 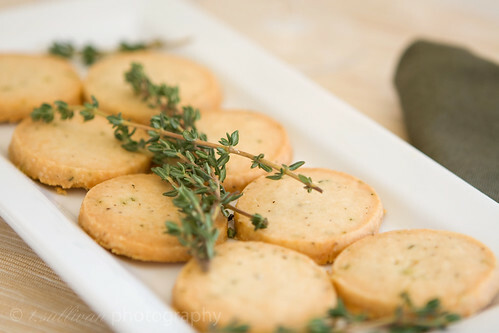 There were several recipes in Back to Basics that caught my eye, but the one I tried first was Ina’s Parmesan Thyme Crackers recipe. How could I not? 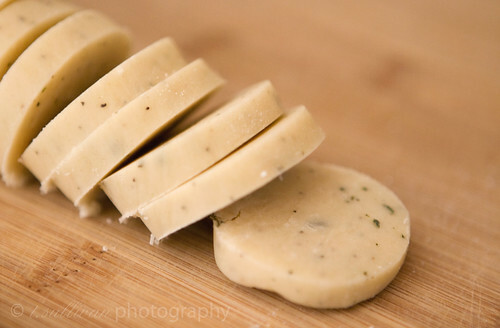 It has 4 ingredients (plus salt and pepper), and two of them are Parmesan and butter! Despite the short ingredient list, these crackers are surprisingly delicious. Baking them made my whole house smell like Parmesan. For a moment I thought I had died and gone to Heaven! The crackers themselves are tender and crumbly, but not overly dry, with a fantastic savory cheese taste. They pair really nicely with a glass of wine and would make a great appetizer when entertaining. Just be careful because they sneak up on you. First you have one, then another, and next thing you know you’ve eaten 5 or 6! Because of the short ingredient list, you’ll want to use the highest quality ingredients you can get your hands on. The pre-grated Parmesan is fine on my spaghetti, but for this recipe I grated a block of real Parmigiano-Reggiano (the expensive stuff) by hand. It was worth it. Preheat oven to 350°. Cut log into 3/8 inch rounds (18-20 of them) and place on a parchment or silpat lined baking sheet. Bake 18-22 minutes (start checking at 15), until lightly browned. Rotate pan once during baking to ensure evening browning. Cool and serve room temperature. I didn’t like Ina Garten until I watched her “Chefography” on Food Network. She was a lot more likable after I learned more about her life. Especially the fact that she camped and backpacked across Europe when she was young — I can’t picture her doing that. The crackers look delicious! I had read that about Ina and it is hard to picture her camping in Europe! I agree about Ina Garten. Her food looks delicious but I have a hard time listening to her. And that laugh! Gah! As someone who lived in the Hamptons I can totally relate. She doesn’t embody the Hamptons the way she thinks she does. In fact I hate her show for the same reasons you do. And the camera work makes me ill. But her food is great… she used to run a gourmet deli in East Hampton called the Barefoot Contessa. It was a popular spot for morning coffee drinkers and there was tons of gorgeously prepared food. Potato salad was $12 a pound but it sure did look delicious! Ugh, Ina Garten. Her’s is my second least favorite show on Food Network. The first is the one with that spiky-haired blond lady … something about a Restaurant Chef? It’s obnoxious. Oh, and I’m really loving that second photo! Thanks! :) I’ve only seen the commercials for the spiky haired lady show so far, so I’m not sure how I feel about that one yet. I adore Ina. She’s actually one of my favorite celebrity “chefs.” I love her Back to Basics cookbook. So many of the recipes are just absolutely delicious. I highly recommend it. I’ve been meaning to make these crackers. They came out lovely! You should definitely make the crackers! The cookbook is fantastic, as are the couple of others I have from her. I do really like her approach to cooking, I just wish she appeared more comfortable and sincere on camera. I actually released an audible gasp when I read that. I find her so warm and charming and I’m almost (okay maybe kind of) obsessed with her. And I love her approach to food. Well, I knew not everyone would agree with me :) I do like her approach to food (I have several of her cookbooks), I just can’t get into her show!